Lee Eynon of Füüdblog tells us how he ate Cardiff. It all started as a terrible mistake. The novelty of Man Vs Food hadn’t worn off yet, and me and Pete thought we could handle the (now defunct) North Star pub’s giant burger challenge. It was a very, very big burger. The size of a dozen quarter pounders. After half an hour of glumly shovelling room temperature grey mince into our mouths we finally realised how wrong we were. While our respective other halves tried not to dwell too much on the terrible relationship choices that had led them there, I came to a realisation; food can be funny. That’s how Füüdblog was born. I wrote about the experience of debasing myself with that sofa-cushion-sized behemoth of a burger to get a laugh – and it worked. Cut to four years later and it’s been a bit of a ride. I’ve found myself invited to restaurant openings, quoted on WalesOnline, judging a sandwich competition, becoming embroiled in the odd Twitter barney and even helping brew a beer. I’ve also experienced a new side to the city I call home, and I’m grateful for that. People can be a bit down on the Cardiff food scene. It’s true that we’ll never be a London – we won’t even be a Bristol for a few years yet; there are too many boring chains in the city centre, we don’t have a Michelin Star standard restaurant and yes, we’re all a bit tired of new burger places. But our food scene does have passion, guts and an incredible collaborative spirit. Maybe it’s born of being such a small city, but everywhere I look I see small Cardiff food and drink businesses working together, pooling their skills and knowledge and trying out new things, whether they’re breweries, bakeries, butchers or bars. Meeting the people who make up this amazing, ballsy, giving community is by far the most rewarding thing about food blogging in Cardiff. Our local food and drink industry is full of people literally living their dreams – people who have had the courage to quit a relatively safe, comfortable 9-5 lifestyle to pursue something they love. Not that I’m trying to romanticise it – speak to anyone in the business and they’ll tell you it’s a daily battle. From exorbitant business rates to no-shows and fake TripAdvisor reviews, there’s no shortage of obstacles to making a living feeding and watering others. But you know what? Speak to Phil from Dusty Knuckle, Rhys and Adam from Crafty Devil, Shauna and Sam from Hangfire or a dozen others and I guarantee that they’ll tell you it’s been worth the blood, sweat, tears, burns and heartache. And that’s why I think it’s worth writing about what they do. Its name may mean ‘taste of the sea’ but it’s just as much a taste of Wales – the Dusty Knuckle team are obsessive about using the best quality Welsh produce on their wood fired Neapolitan-style pizzas. This cockle, bacon and samphire crowned masterpiece will have you on your feet blasting out the anthem after a couple of bites. You can get steak and chips in Wetherspoons for about a tenner. You can also do this at Asador 44 with their lunch menu. One will be a tasteless slice of shoe leather. The other will be a thick, juicy slice of heaven on a plate that you’ll want to eat in silence with your eyes closed. You can probably guess which is which. Remember when you were a kid and you wanted to have all the variety pack cereals at once but you weren’t allowed? Well imagine finally being able to do that, only with meat. The PBP is a taste of everything that has quite rightly made Hangfire Southern Kitchen famous – barbecue, cooked low and slow the way it’s meant to be. Their restaurant may be in Barry, but the Hangfire ladies cut their teeth in The ‘Diff and they pop-up here enough that I reckon we can still call them our own. “A chocolate brownie can’t be that good can it? !” – try saying that after eating one from Pettigrew’s. You won’t be able to. Partly because your mouth will be stuck together with the gooiest, richest, most magnificently chocolatey lump of loveliness you’ve ever tasted, but also because you’ll realise just how wrong you were. Better than any kebab and surprisingly palatable while sober, this is a true Cardiff staple. You have never truly tasted life in the Welsh capital until you’ve sunk one too many pints of Brains on match day, meandered your way up to Caroline Street and devoured a polystyrene cartonful of this glorious stodge. Big thanks to Lee for this great round up of his best Cardiff eats! 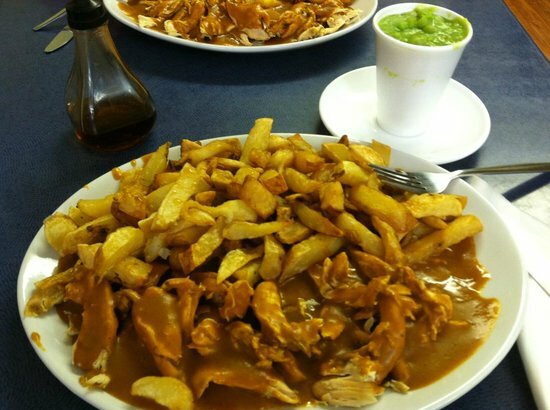 Now who fancies a trip down Chippy Lane?? ← New business klaxon! Welsh Cheese Company brings the finest Welsh cheeses TO YOUR DOOR!